Broadband @ Home » Broadband News » Elon Musk making Satellite Internet more Viable? Elon Musk making Satellite Internet more Viable? In a sense, satellite Internet service is the red-headed stepchild of the industry. While it allows those in underserved rural regions to enjoy access to the Web, generally poor speeds combined with monthly bandwidth limits hamper the quality of service to those users. Some satellite ISPs even place additional bandwidth caps on their customers during peak usage hours. 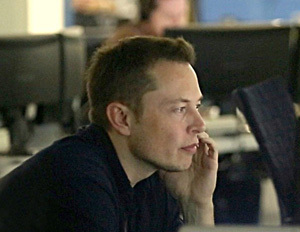 Elon Musk in Mission Control at SpaceX. Photo courtesy Wikimedia Commons. Well, it looks like the market for satellite Internet might be changing, due to the work of Elon Musk and the talented engineers at SpaceX. Let’s look more closely at the details to see if viable satellite ISPs are in your future. In mid-February, SpaceX launched two satellites from Vandenberg Air Force Base in California. These experimental satellites focus on providing broadband Internet services; part of Musk’s plans for a worldwide satellite-based Internet network. News about the SpaceX launches appeared in the Washington Post, among other sources. Musk’s primary focus is providing Internet access to developing countries across the world – essentially an orbital version of Google’s SkyBender initiative. Still, wealthier countries also stand to benefit, including the United States. The traditional rule about competition lowering prices and improving service applies in this case. These new SpaceX satellites operate at a lower orbit compared to the others used for Internet access. This means signals are able to be transmitted significantly faster. This brings the potential to greatly improve the poor latency current hampering satellite Internet service. With more gaming and Internet of Things applications requiring low latency values, SpaceX’s efforts might truly revolutionize this form of Internet service. Other companies are also working on similar technology. The SpaceX initiative is also similar to Microsoft’s efforts to deliver broadband to rural America, known as CAN (Connect America Now). The cost of installing fiber hampers the spread of high-speed Internet in rural regions in the United States. Michael Calabrese, director of the Wireless Future Project at the New America Foundation, commented on the influence of these innovations. “For competition, it’s particularly good, because it’ll allow these guys to overbuild — in other words, to become a competitive provider at relatively low capital cost,” said Calabrese. Stay tuned to see if Elon Musk’s efforts change the telecommunications industry and improve Internet access across the globe.